It’s easy to feel despondent about the graduate market; headlines screaming out news of 52 applicants chasing every vacancy, are enough to weaken the resolve of the most resilient job seeker. So should you be taking a low skilled, stop-gap job to cushion yourself against unemployment or wait for something better? It ain’t what you do, it’s the way that you sell it! Online forums are littered with anecdotal evidence that filler jobs are good – “any experience is better than none” and bad – “recruiters will think you lack focus and motivation”. I think the argument centres less around what you do, than how you sell it. It calls to mind a recent conversation I had with one of our graduate recruiters, who was keen to stress that relevant work experience – whilst desirable – is only meaningful where the applicant clearly articulates the benefits. And many don’t. You can go further with less, so don’t write yourself off because you haven’t had any industry or sector experience. Stop-gap or filler jobs can offer a surprisingly rich seam to draw from. An AGR report suggested that Employers can’t always find graduates with the right skills. with many employers citing a skills deficit as a contributory factor. Effective communication skills and team working capabilities are valued highly by employers, but these are areas of particular weakness for many graduate applicants. And here’s the thing: these are exactly the skills that you’ll acquire through temporary, stop-gap or ‘filler’ roles. Holding out for your big break might spare your pride, but fallow time will add nothing to your CV and simply leave recruiters wondering whether you can adapt to a work environment. When the time comes for you to move into more substantive, challenging role, you’ll be ‘work ready’. Don’t underestimate the importance of this. Punctuality and time keeping are essential whether you’re working a bar shift or modelling economic growth. Whatever the job you’ll probably encounter colleagues you like and respect, and those you don’t. Again this is good preparation for – and a mirror of – the professional workplace. You’ll acquire the evidence and examples to strengthen future applications. Telling an employer that you’ve worked in a call centre is unlikely to impress: telling them that you’ve developed organisational, communication and team working skills in a customer-facing role may go a little further. Stop-gap jobs may not be the most fulfilling, but they’ll keep you afloat financially whilst you re-double your efforts to find more challenging work. If you’re still trying to find your career niche, temping can be a great way of exploring different fields and may lead to some interesting opportunities. And at worst? Well you’ll have some breathing space to consider where your future lies. With the right approach and positive attitude, you’ll develop a strong work ethic. This isn’t just desirable, it’s essential if you want to compete for graduate-track jobs. If you’re still working in a bar two years after graduation it might be time to take stock. It’s important for your self esteem (and ’employability’) to keep moving forward and you probably won’t be learning anything new after two years in a service oriented job. Good administrative skills are a must-have for many entry level and graduate positions, so why not find office or admin roles instead? Remaining in a job that stifles your motivation is counter-productive, as you’ll permeate negativity through any applications and interviews. 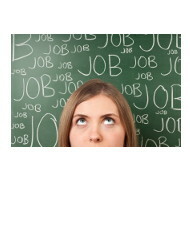 For cash strapped graduates taking a filler job is often a necessity, but try to avoid stagnating in the same job. Don’t define yourself by your ‘filler’ job. You need to continue building your CV, but you can accomplish this through other means: learn a language, volunteer, set up a website, or start blogging. You may not be in your chosen sector, but you can still make contacts. Join a professional association (if relevant), follow companies (and individuals) on Twitter and don’t be afraid to use LinkedIn as a resource and network. Set yourself a timescale for when you want to move on and stick to it. Or try to! Be realistic about what you can achieve and when, but don’t expect change by osmosis. You have to put yourself in the driving seat. You don’t want to be pigeon-holed as a job-hopper, so move on when you need to, but stay long enough to pick up a good reference. Improve your digital literacy, as over 90% of new jobs will require excellent digital skills. Gen Y are often seen as the tech savvy generation, but there’s a huge gulf between being digitally aware and digitally proficient. And remember, a stop-gap job is just a staging post on the way to something better. Tags: CV, Job search, Skills. Bookmark the permalink.